A good arborist hand saw is an investment worth protecting with a quality scabbard. WesSpur stocks hand saw scabbards, pole saw scabbards, pruner pockets, and leg style scabbards for tree climbers. All of our leather or rubberized scabbards are made with pride in the USA by Weaver Arborist. We also stock replacement scabbards for your Silky saw. Scabbards are available made from your choice of great looking natural leather, or a rubberized ”belted” material that is durable and water, mold, and rot resistant. These saw scabbards are available in fine leather or water-resistant belted rubber. They fit Fanno, Felco, Fred Marvin, and Corona 13” arborist hand saws. These saw scabbards are available in fine leather or water-resistant belted rubber. They fit Fanno, Felco, Fred Marvin, and Corona 15” arborist hand saws. These saw scabbards are available in fine leather or water-resistant belted rubber. They fit Fanno, Felco, Fred Marvin, and Corona 20” -24” arborist hand saws. A leg style scabbard is a great way to carry a saw without cluttering up your work area at the belt level. Strap this scabbard on your calf, and you have an easy-to-reach place to carry your 13” Fanno, Felco, Fred Marvin, or Corona arborist hand saws that isn't in your way. Tough, rubberized scabbard made for pole saws that use the Silky-compatible pole saw head to mount the Ibuki or Hayauchi blades. This scabbard fits 13” arborist hand saws like the Fanno Tri-edge saw and Corona Razor Tooth 13” saw, and has a built-in pocket that will fit a hand pruner like the Felco standard hand pruner. Available in leather or belted rubber. The hard plastic scabbards that come with Silky saws are not everyone's cup of tea, so we've brought on a rubberized scabbard that will fit the Silky Ibuki and Sugoi for folks who prefer this style of sheathe (the Zübat will fit in one of the 13" scabbards listed above). Saw sold separately. The Sawpod is a quick way to mount any plastic-sheathed saw on your leg quickly and comfortably. It can be used by right or left-hand users to make the saw more easily accessible in the tree. The saw fits into the Sawpod in its plastic sheathe, and the straps are cinched down, holding it in place against the grippy texture of the Sawpod. The Sawpod itself is thick neoprene for a much more comfortable fit than strapping a hard plastic scabbard directly to your leg. New-style replacement scabbards for the Silky Zubat Professional series saws. These scabbards feature an improved snap-in lock to secure the saw, heavy-duty rollers to protect the sheath, slots for leg straps, and no swivel on the removeable belt-clip. This hard plastic scabbard can be strapped to the leg or worn on the belt, and will fit the Silky Zübat, Ibuki, and Sugoi 360 saws. Replacement hard plastic sheathe for the larger Silky Sugoi 420 saw. Includes leg straps. Replacement hard plastic sheathe for the Silky Ibuki Saw. Replacement elastic and Velcro leg straps for the following Silky Saws: Zübat 240, 270, 300, 330, and 390; Sugoi 360 and 420; Ibuki 390; Kamisorime 375; Sugowaza 420; Tsurugi 200, 300, and 400. The straps are 24” long, 1.6” wide, and weigh .06 lb (27g). This improved holster for your hand pruner can be worn on a belt or saddle or clipped onto the waist or pocket of your pants. Fine leather, seams are stitched and riveted. Don't forget one of these handy pruner holders to protect your new tools! Ballistic Hand Pruner Scabbard New in 2019! Durable, synthetic hand-pruner scabbard with clip. 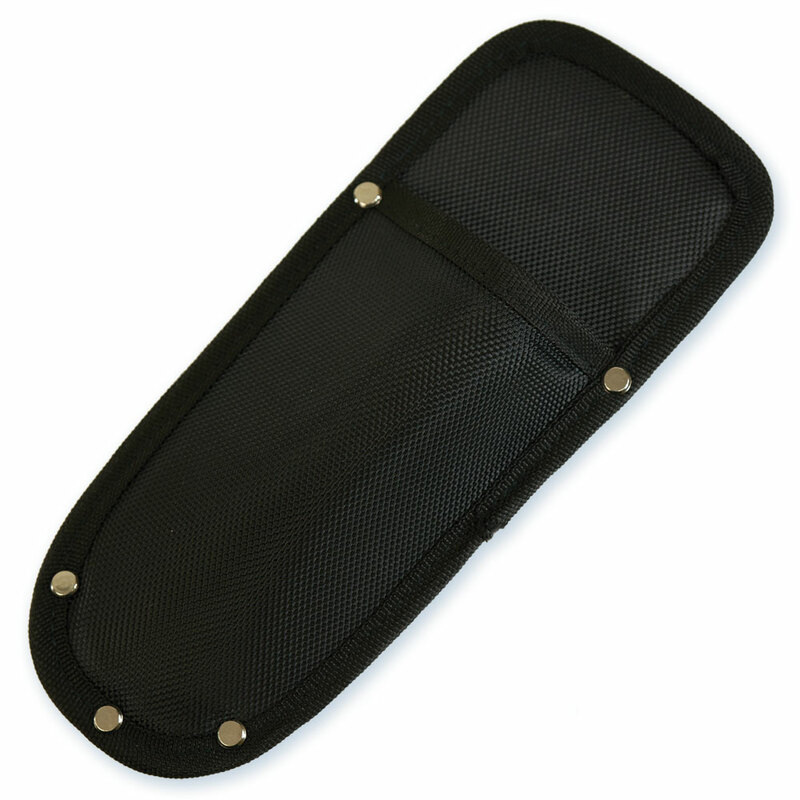 A durable, inexpensive way to carry and protect your machete, and also protect your other gear from the sharp edge when transporting or storing your tools. Leather axe cover fits blade edges up to 5 3/8” long and buckles to secure. Made from premium leather in the U.S.A.
Great tool for quickly honing any non-serrated blade edge. Lifetime warranty. Made in the U.S.A. This great little tool fits easily in a pocket and quickly sharpens any blade with just a few quick strokes. Great for pruners, knives, and other tools.